Benalmadena, Benalmadena Pueblo Spain hotels etc. Information about Benalmadena, Benalmadena Pueblo and Arroyo de la Miel Spain. Information about Benalmadena Costa Del Sol (Map) Property available to rent Benalmadena Property For sale Benalmadena stay in Hotels in Benalmadena. 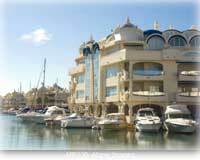 Benalmadena is situated on the Costa del Sol and lies between Malaga and Fuengirola. It is almost an extension of Torremolinos. It is made up of three totally different centers, Benalmadena Pueblo, Arroyo de la Miel and Benalmadena Costa. Benalmadena Pueblo is a typical Andalusia village set in the mountains. Visit the spectacular monument erected in honor of Christopher Columbus, and see the Birds of prey. The Archeological Museum in Pueblo houses a collection of mainly South American artefacts, pre-dating the Discovery of America. Take the lift up to the local church and the small walled gardens, where you can admire the view. Arroyo de la Miel is a commercial village, famous for its popular attractions such as Tivoli World Fun park, where you can try the thrilling rides or relax by the bars whilst watching one of its many excellent shows. The Teleferico or cable car will take you to the peak of Mount Calmorro, more than 600m high. Cities in Spain to visit Alicante, Barcelona, Granada, Madrid, Malaga, Murcia, Ronda Seville and Valencia on your holidays in Spain. Places to visit in Andalusia Almeria, Benalmadena, Estepona, Cadiz, Fuengirola ,Jerez Huelva Mijas, Marbella, Nerja and Torremolinos.on your cheap holidays in Spain.